We disagree. The Callaway Corvette is not akin to a "neon billet mobile", as it was a factory option built under RPO B2K from 1987-1991, and then again in 2012. What I can agree with is the decline of interest in cars, as a whole. Younger people don't care. They are not out driving like a celebratory rite of passage, when I was in my youth. It's just different these days. That's not to signal the death of cars though. Right now, those in their late 30s-50s are who's buying the B2K Twin Turbo Callaway's, mostly. I see it every month and get calls/email every week , asking where the good cars are. The ZR-1 group has gone through more iterations over the years, and for many reasons. The marque at hand, the www.callawayownersgroup.com is still operational and active, as it's been the past 16+ years. At Corvettes at Carlisle this year, same as last, and others before, the COG row was overfilled, cars in the back of others. It was busy with cars and interest. But it's also undeniable, much of the shift in cars displayed have gone from C4 versions to mostly C6 and C7, with the early Twin Turbo and SuperNaturals peppered in between. Pretty cool to see 30 years of production at these events. Who knows what the future will bring, but AeroBody Twin Turbos and AB SuperNaturals are continuing to bring big interest. I may have mentioned it already, but my point is that people that like and appreciate cars in the younger generations like newer stuff. It is pushed on them. Loans are pushed on them. The kids on Youtube are buying cars in order to buy more toys, this is the opposite of history for the working stiff that liked cars. The infamous Matt Farah what ever we all think of him drove a Callaway on film last year. It was embarrassing for the C4 and callaway. Almost everyone drive he has done in a c4 has been so. That is the average Joe hearing that review. Educated review or not that is the word on the street. No ties to a c4= no interest for those people. We cling to what we like and that is fine, but there have been all kinds of cars and gimmicks out there. What still hold the interest and value for now? 60s-70s muscle cars are sure bet or have been at least. IMO if you have a callaway and think it is worth something and are getting old you'd better sell at these current high prices. Price of 50K gets you a hell of a lot of car these days, and ANY C4 just don't measure up in any way. For collections... Sure maybe some rich kid will still like them because he heard a family member drool or had one. 200k for a speedster? okay, and sell it to who another old guy here that is ready to kick and has the funds and always liked them? How many are chasing that car at that price? Who cares if you got a 200k speedster c4 if that is what you are blowing 200k for. The basis for my opinion on this is that it seems kids buy cars for status now, not the car hobby, and the ones being noticed are online and others follow those trends. it is making them money, getting them "fans" etc. This is not the old "everybody loves and appreciates old cars" sure some old guys like the 1927+ old cars. Any kids even know what that is or care? IMO If the sledgehammer was the car offered, it would be the legend and be wanted for the history. 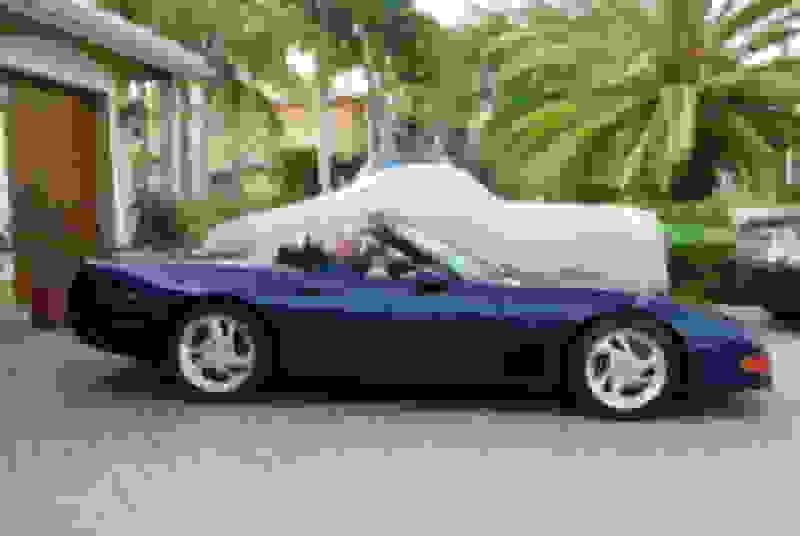 EDIT: I just googled C4 callaway corvette and got this. This is not good for selling. 30K for this car? I don't see people jumping at it. I'm just trying to explain my comments. I also don't think anybody in their 20's is interested in that. Then you drive a C4 that is 50 as someone said these are worth vs the C6 callway 632 hp for 48k? and looks cool... I'd be shocked if the C4 is picked. i'm not knocking them, I'm only saying they had their time in the sun for a small group of people and made some money and lost some people money. Now they are just old cars out there. Last edited by pologreen1; 11-12-2018 at 11:48 AM. About a year and a half ago an 87 coupe sold for $15k at my local Chevy dealer. I looked at it and drove it but passed on it. Fun car, but I went with a 90 ZR-1. There are some deals out there. Sorry you don't see the value, but not sure you were ever an enthusiast of our cars, so that's perhaps the biggest reason for your discount or dismissal of their place in C4 history and their related values. On the article published by Hagerty, it's sad they ran with that article, especially since Hagerty insures many of our customer cars with AGREED VALUES so much higher than in the drivel they put forth in that editorial. Bad business model for Hagerty if they believed that, as they have underwritten good cars for far more. So you and others keep posting a Burgundy 1987 with "incorrect wheels" which is advertised for $30k, or about $8k more than most 87s are trading for. Okay. What's the point. On the Speedsters, on the notion I have a line for buying clean AeroBody coupes (1989-1991), the line for Speedsters is just as long. A waiting list exists. Last buyer was around 30 years old, wanted one, and got one. Last edited by Callaway Chris; 11-12-2018 at 12:01 PM. Oh, OK, thanks. So it's a well known car. I will look into it. Thanks for the tip. Last edited by Zak2018; 11-12-2018 at 04:23 PM. As for the discussion going on, I can see where pologreen1 is coming from. Coincidentally, I just happened to show some pictures of a Speedster to my 15 years old nephew today to get his thoughts and he basically said it looks like s- - t! I was like, what? It looks exotic. And he came back, it looks old and goofy. The proportions are wrong and it looks home made. But he looks at a Hurracan and finds it fantastic. He then said the C7 looks much better than the Speedster. I would take a Speedster over any C7 when it comes to looks. But to him it's just an old car. Pologreen1 is absolutely right. Kids these days only want the newest and greatest. It's not even only the kids. People in general. So yes. Once the generation who were kids when the C4 was new die off, so will interest for the C4, including Callaways. A Corvette doesn't have the clout of a Ferrari or a Porsche, unfortunately. So the chances of prices keeping rising is small. I think the C4 will be a classic. But as far as Callaways commanding absurd prices for much longer I also see an end to it. The Speedsters less so because of the simple supply vs demand. But for the run of the mill AeroBody and twin turbos which seem to have been made in the 500s, interest will go down. Look at the Lotus Esprit for example. A car with arguably way more pedigree with Lotus being several times world champion in F1 and having had several legends driving for them. Only now the S1 Esprit is starting to appreciate in price and even then if you compare it to Porsches of the same vintage they still cheap. But S3 and S4 Esprits are still pretty much stuck at normal old car values. It doesn't help that they are based on the C4 which at this point is the least desirable Corvette. To me I like the C4 a lot. But most of the public doesn't seem to agree. Yes, I also saw the Matt Farah review on YT. What a biased useless review. He just showed he doesn't really knows much about the cars and is only repeating what other people say. What makes it more ridiculous is that by the middle of the review you could see he wanted to like the car a lot but seemed ashamed or something to totally say it. But as Pologreen1 says, this is the opinion of the general public about the C4, unfortunately. But for the run of the mill AeroBody and twin turbos which seem to have been made in the 500s, interest will go down. Pretty interesting thought that's completely opposite of the way the market is actually moving. Prices for Aerobody cars are holding steady and actually increasing in the later year cars. 91's are picking up ground. I was talking in the future, as per Pologreen's theory, which I agree with. CTTC were bad azz in late 80s and early 90s and ran with the fastest Ferraris and Lamborghinis and those guys didn't offer convertibles too. Look up the stats. Built for me personally in 1991 and still own today. So hang on a minute... You think prices are going to go up now from where they were 10-15 years ago only to turn around and go back down again in the future? ok Remind me not to take investment advice from you. Cool, we'll see in 50 years I guess. Are you going to be a live and able to drive? Is the car even going to be allowed on the road? Maybe you like expensive match box toys. We don't know and we will see. I hope you are right for your sake. I'm not being a hater, I just don't think people look at this all realistically. Basing things on the past makes no sense anymore. Sure a few old guys with cash might blow the coin on them, but once or twice more and the cars will be sitting somewhere either in a collection or rotting away. You nailed it down. I would never pay for those cars, but that is not me thinking of me that is me thinking and watching the sales. An enthusiast might but how long?Again. Most guys here are old, lets face it. Not too many kids 20's-30's have funds to get them and if they do they want newer and faster. That '87 is a typical B2k correct? I'm not knocking it, it is a general c4. To me ugly as sin that color combo and common. Buy that and everyone thinks you got a 5k car. Cool, or you feel like a hotshot until you get smoked by a c5+ playing around. That famous green aerobody stuff si cool no doubt, but most callaways are what is pictured. It is just what popped up. I'm not saying they are not selling, I'm saying this is most likely the peak of the bubble or getting there. Hopefully I'm wrong. All the old guys here with these will be real old in 10 years. What is an 87+ callaway in 10 years to te public? Chevy is not even targeting vette guys anymore and since then sales went up to new markets. Last edited by pologreen1; 11-12-2018 at 08:19 PM. I think you've continued to miss my point. not everyone who's bought a Callaway Corvette is on this site. I mean, really, how many active owners are on this site? And the "Sales" you are watching, from where? Ebay? That's reality though. I have sold a few cars for owners via word of mouth, and the $40k-$50k range for really good AeroBody 6 speed cars is solid. Cars with excuses, not so much, and the more common 1987 cars, market shows lower dollar sales. Harping on an 87 isn't doing much for credibility of your post, when we've all agreed that's the entry level B2K, even as much fun as those are. No doubt it left an impression..todays cars leave the same on youngsters too its just different. Noone could go to a dealership and walk out with a 4-700hp car back then, today they are common place. Last edited by cuisinartvette; 11-12-2018 at 11:40 PM. I have never been in one, so I'll take your word for it. I'm just saying it is a small group of people that can and will buy them and the pool is getting smaller. I'm not sure on the power numbers, but the numbers I seen were awesome for back then. 400s,500s and the 800+hp magazine car. Not that it matters, because it doesn't and I'm sure there is no comparison, but I have a decently built c4.. I'm sure the old TQ stuff with twin turbos felt nutty. Yes a built c4 is fun I can agree with that. I'm just saying I can imagine they are fun, still not enough to justify those prices. This time I'll speak for myself only on that. Also; I promise my car is fun for me and not you. Way too loud, way too aggressive and is obnoxious. Not apples to apples, but you said you liked the car 30 years ago... well, it was different and cool, still not radical. Now people make way more power and they behave just fine. mine is set up for the raw experience, but i can make do TT on my dart block and make 3x the power they did and still idle fine etc. Serious question, since you are the guy to ask I suppose. Have you driven a gen 1 /2 viper? If so how did they compare to them back then? I assume the torque was similar, but the power band suffered as usual, were the B2k cars give suspension upgrade and chassis stiffeners? Just as a side note: I do "bash" on c4's sometimes even sarcastically, but I don't drive one because I have to, but because I want to. I found it to be a happy medium of raw potential, yet some technology to build off. I wanted one since the 90's and had 2. Last edited by pologreen1; 11-13-2018 at 12:09 AM. So hang on a minute... You think prices are going to go up now from where they were 10-15 years ago only to turn around and go back down again in the future? ok :rofl. No. I'm saying prices won't continue to go up the older they get and for a long time. Not at the same rate as a Porsche or Ferrari will. Because a Callaway is a limited car in popularity. Everyone knows what a Ferrari and a Porsche is. How many know what a Callaway is? Outside of America basically nobody. In America mainly car guys. But you can ask somebody's granny and chances are she will have heard of Ferrari. So I think prices will stop going up at some point. If it will go down again we will see. At some point, when the current generation who has interest in these cars are no longer here they will be just old C4s with a body kit for the general Joe. Heck, they are already just old C4s with a body kit for most people I bet. Unless the C4 somehow do a 180 turn and becomes a very desirable classic on itself. So LOL as much as you want. But this is what I'm saying, which I think is basically the same Pologreen1 is saying. And before you bring up American muscle cars as example, remember that nobody glorifies C4s in pop culture. You don't see action heroes driving a C4 in movies. Muscle cars are already part of pop culture. When was the last time somebody drove a C4 in a movie because it was cool? Last I remember was Face in The A-Team. How old is Dirk Benedict , the actor who played Face? This is the generation who remembers the C4. This was the last time the C4 was in pop culture's mind as being cool. Because most of the general public don't even remember the ZR-1. You just need to look around at other old cars. For example the Pantera. It finally started going up in price a few years ago. But it's nowhere around the top classics in price. And it has a lot going on for it being Italian and considered an exotic. It's also not a tuner's car made on top of a popular cheap model. It has the chance of keeping going up in prices. But look where it still stands after more than 40 years. It's Italian, at least 10 years older than the C4, an exotic and you can still buy good ones for under $100K. Ditto with the Lotus Esprit as I mentioned already. Now I'm a C4 fan. I'm a Callaway fan. I think the Speedster is a great design and would rather have one than some low end Ferrari. Don't get me wrong. I'm just trying to look at it with realism as Pologreen1 is. That's all. For the record I think the future for the C5 is as bleak or even bleaker. Because the C5 Callaways seem even more obscure than the C4 Callaways and to be honest not as striking in design. It also seems to me they hold a much less important spot in Corvette history. They were much less successful products it seems too. The C5 top dog is mainly the Z06, which is not ZR-1 special with a special engine and a special history. This is something which often gets missed in fan sites. Unless you are only praising it's seen as negative opinion. If you are trying to be realistic and look at it from the point of view of non fans, even if that's not your opinion, you may be perceived as or even labeled a hater. But it doesn't mean you don't like the car. How do you value fine artwork produced by a genius since its simply paint and canvas? The C4 canvas is an inferior platform compared today. No question. But it was the genius in turbo and mechanical engineering ( Reeves Callaway) and the genius in aerodynamic and design (Paul Duetchman) that brought the car to a world class level. Callaway aerobody cars are "artwork" and not a mass produced product. I spent $100,000 for mine at the time and had no problem forking it over. It was custom artwork. A 1951-53 Cunningham C1 is now a $1.0+ million car. Are the constructors or owners of those original cars still around? Are those cars better than today's cars? Were they worth $10,000 in early 70s (~$40,000 in today's dollar terms)? Its often when everybody is long dead that the genius is truly appreciated and the enhanced value is realized. In the meantime, lets all live long and prosper! I also know what you mean about your car and the Dart block, etc. and being raw in experience. But I also don't believe for a moment, a big cam, big displacement, loud exhaust car is anything most want to live with on a daily basis. Sure, cool for some time, but it gets tiresome to deal with. Many of our buyers then, and still today: BTDT. Heck, I've even BTDT. Dodge Viper. Drive one, and you will probably never want to again. It's a chore. Needs a lot of focus, and pretty brutal. The exhaust note, especially on Gen 1 cars was terrible sounding with a wheeze. Horrible cars, and aside from a semi-nostalgic look, what's the draw? That said, I can appreciate what they are, and the late 90s coupes look (and sounded) better than early side pipe cars. Hopefully you get a chance to get into a Callaway Twin Turbo one day, or at least go for a ride in a sorted car.